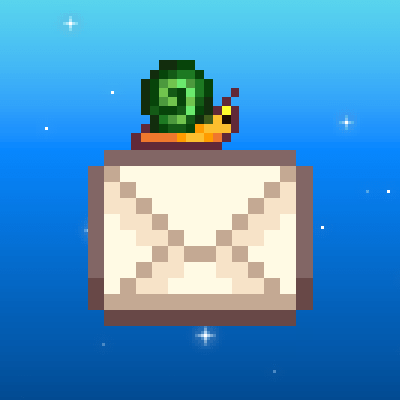 This mod adds new types of mail to the game and aims to improve the over all diversity of mail. Each new mail entry aims to fit within the world and lore of the base game. Some of the mail reveals useful information that is not normally available in game. These letters may also contain items, quests, recipes, and other in game things. There are currently 8 letters in the latest release with plans to add more over time. List of all letters and how to get them. Blacksmith Update - If you have an upgraded tool at the blacksmith and it is ready to be picked up, Clint will send you a message reminding you to get it. Secret Woods - Once you have the steel axe or better, Jas will send you a message asking you to clear the secret woods so they can play there. This letter exists to tip players off to the existence of the secret woods. Dish of the day - There is a 10% chance every day for Gus to send you a message about the special at the Star Drop saloon. Dish of the day sample - There is a 5% chance that the regular dish of the day letter will be replaced with one that contains a free sample. Legendary Spring Fish - If the player has level 10 fishing and it is spring, they will get a letter from willy containing info on finding the spring legendary fish. Legendary Summer Fish - If the player has at least level 5 fishing and it is summer, they will get a letter from Eliot with info on finding the summer legendary fish. Legendary Fall Fish - If the player has at least level 3 fishing and it is fall, they will get a letter from Willy containing info on finding the fall legendary fish. Legendary Winter Fish - If the player has at least level 6 fishing and it is winter, they will get a letter from Willy containing info on finding the winter legendary fish. This mod was created for StarJam 2018 modding event. If you like this mod you can vote for it here.